Donna Jean Martin was born in Everett, Washington during the daffodil blooms on March 10, 1936. Must have been why she was so happy, bright and positive all the time. Donna leaves behind her Son and Daughter in law, Randy William, Sally Moui Tam Martin, Her grandchildren Stephanie Tam Martin and granddaughter Emily Tam Njambi; Tiffany and grandson Jax Matthew Martin; Daughter and Son in law Amy Elizabeth Swing, Louis William Swing and her grandsons Taden Zane, Tegan Zane, and Tanen Zane Swing. With her mother and father, Lois and Virgil Bohnstedt, and her 4 siblings Lavern, Joy, June, and Don. Donna moved to the Sweet Home area where she grew up. Donna graduated with honors from Sweet Home High School. All the guys had their eyes on her. Shortly after, she met her husband Myron Tallyrand Martin at the Lebanon Skating Rink. “It was love at first sight”. They were married on October 10, 1956; a special date that they share with the birth of their grandson Tanen. Myron “Marty” enlisted in the Army and was stationed in Germany where he and Donna had their first-born son, “Randy William Martin”, six weeks premature. Donna grew ill after giving birth due to ulcerative colitis and fell into a coma which prompted emergency surgery. A surgery that was not well known and the first one done in Germany by Dr. Nibling. He saved her life and later was her doctor for approximately 35 years in the states. He had a picture of mom sitting on his desk his at his practice because he was so proud of saving her life. After the Army, Donna and her husband Marty settled in California where they raised Randy and fostered 17 children. Their daughter Amy was one of their foster kids, “the lucky one” that was adopted. 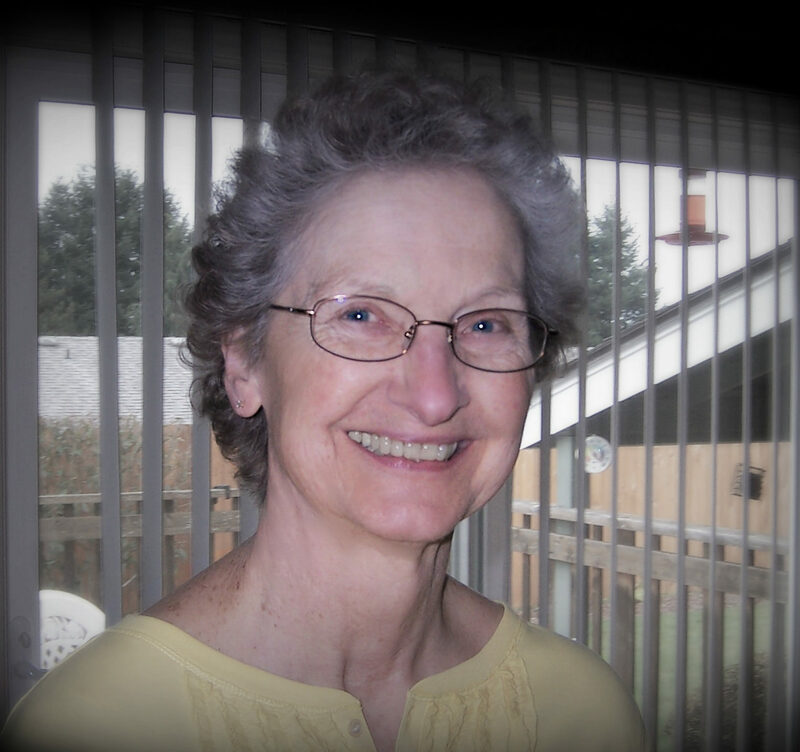 Donna was a mother who stayed home to care for her husband, children and foster kids. In the nineties Donna and Marty reunited their love for Oregon by moving back and settled in Salem where her brother Don lived nearby. Soon her sisters Lavern and Joy joined them with their husbands. In 1999, Amy and Donna’s grandson Taden joined the Oregonians and later her nieces Kathy, Karen, Susie, and Theresa. Donna was an avid bowler. She bowled for 50 years up until this past December a month before she went to heaven. She loved spending time with her Grandchildren. Stephanie, and Tiffany would come out for the summers and sightsee. She went to every baseball game of Taden’s from T-ball through High school. She sat through many of Taden, Tegan, & Tanen’s baseball, basketball, soccer games and several swim meets. Donna and Marty loved to travel Oregon. They went on many drives, weekend getaways, boating and saw many covered bridges. After the death of her husband in 2013 she spent much of her time with her daughter and sisters and nieces. She loved puzzles, organizing photos, game night with family, the senior center, playing bingo with her brother and sisters, and organizing old movies taken by her dad. She organized many Sunnyside grade school reunions and loved sharing her new projects for her class reunions. Her organizational skills were exceptional. Donna had a genuine uniqueness about her that is rare. You don’t see it in many people, if at all, anymore. She had a beaming smile. If you knew her you know what I’m talking about. Donna lit up the room. Donna had an amazing God given talent to make people feel loved and accepted. She was contagious in that everyone wanted to be around her because she was the balance people needed. Love you very much Donna. Will always be in my heart. Love all the things you helped me with and did for me. Donna was always my playmate. She would always play dolls with me. Even when she did nor want too. Well until one of her many boy friends would drive up, and away they went. She helped me fix my hair and many other things. She is my sister and best friend. Love you so much Donna and will miss you a lot. She is always in my heart. I loved spending my Summer vacations with you swimming at your house, and watching you bowl. You were kind and gracious. I will forever remember all the good times we shared. Rest In Peace Donna. My condolences to Randy & Amy and all her family members. Thank you for trusting Johnson Funeral Home with Donna’s arrangements. We wish all of her family peace during this difficult time.